I am a big proponent of taking probiotics, naturally such as eating low fat yogurt oral supplements, that you can buy at www.LindaLaRue.com. Don't go searching for a bacteria shake just yet — scientists are still investigating which bacteria do what in humans. Something in your gut could be making you fat — and it isn't just last night's pizza. 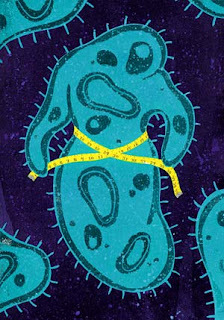 The vast, diverse community of microbes inhabiting the intestines, scientists are finding, can influence metabolism and weight. Between 10 trillion and 100 trillion microbes, mainly bacteria, dwell in a person's colon and small intestine. They function together almost like another of the body's organs, influencing, among other things, how many calories we extract from our food and whether we make or burn fat. Researchers have discovered significant links between gut bacteria and weight and metabolism in mice — and are starting to find similar associations in people. The story in humans is far from certain, though, and scientists say it's too soon to concoct microbe-filled "stay-slim" beverages — a fact that has not prevented some companies from promoting their bacteria-laden products as helpful for weight loss. Bacteria that draw the maximum calories from our food would have been useful to our hunter-gatherer ancestors but are less beneficial for modern people eating an American fast-food diet. In addition to our ready access to high-calorie eats, the bacteria we carry around have changed, says Andrew Gewirtz, an immunologist at Emory University in Atlanta, through antibiotic use, improved hygiene and cleanliness in the food supply. This, he believes, could be one environmental cause for obesity and related conditions such as diabetes. On the whole, our gut bacteria are beneficial, says Ruth Ley, a microbial ecologist at Cornell University in Ithaca, N.Y. They prevent disease-causing bacteria from taking hold in our body simply by filling up all the available space. And they help us digest foods, such as some starches, that we cannot break down ourselves, producing vitamins and energy sources we can use. "You might just generally be sicklier without them," Ley says. Babies are born bacteria-free but start to pick up bacteria during and after birth. Infants mostly collect bacteria from their mothers and others around them; in a sense, the gut community is inherited from family members. If the gut-obesity theory proved correct, that would suggest obesity risk could be passed along with them. "If a person has changes in their gut bacteria — and that could be due to anything, to diet, to antibiotic use — if that person has kids, then they can transfer those gut bacteria and maybe transfer the problem," Gewirtz says. Because people pick up different bacteria from their environments, people have different gut communities. For example, in a study published in the journal Nature in April, scientists reported that some Japanese people could digest compounds in nori, the seaweed in sushi, because they hosted the right bacteria for the job. Every person carries at least 160 different kinds of gut bacteria, scientists estimated in another Nature study published in March. Most fall into two divisions, or phyla: the bacteroidetes and the firmicutes. Both of these groups are found in soil and water as well as in animals. Some cause disease, but many in the intestine are beneficial. The firmicutes, in particular, are good at digesting our food. The more firmicutes in a person's intestines, the more calories they can collect from a meal. Obesity studies. This is where the obesity link comes in. In 2005, Ley and colleagues at the Washington University School of Medicine in St. Louis, where she worked at the time, studied the gut bacteria found in mice, hoping to use them as a model to study obesity. They compared normal, lean mice with ones that were genetically obese because they had a mutation in the hormone leptin, which normally controls appetite and metabolism. As in people, the main intestinal inhabitants of mice were bacteroidetes and firmicutes. But the researchers discovered that obese and lean mice had different proportions of each. In particular, fat mice tended to have more firmicutes, and fewer bacteroidetes, in their guts than lean mice. In another study, Ley and colleagues worked with sterile mice that have no gut bacteria. These mice eat a lot, but don't get fat, presumably because they don't have the bacteria to extract the full complement of calories from their food. But when the scientists transferred the bacteria from fat mice to bacteria-free mice, the recipient mice gained weight. This result, reported in a 2006 Nature paper, directly suggests there's something about the bacterial community in the obese mice that contributes to weight gain. What about human beings? Ley and co-workers examined the proportion of firmicutes and bacteroidetes in 12 people, in a study they also reported in Nature in 2006. They examined bacteria samples from obese people as they followed a yearlong diet program. Before the diet, the subjects had more firmicutes and fewer bacteroidetes than healthy-weight people. As the year progressed and the dieting continued, the bacteroidetes numbers went up, and the firmicutes numbers went down. In addition to squeezing every last available calorie out of the food we eat, bacteria can also influence metabolism by signaling the body to store fat or burn less of it, and slow down food moving through the intestine so there is more time to collect calories. The exact nature of the bacterial signals that influence metabolism is unclear, but in a March article published in the journal Science, Gewirtz and his colleagues reported that bacteria can cause inflammation that alters appetite and weight. Normally, the immune system and gut bacteria maintain a kind of peace, Gewirtz says. But the mutant mice in this experiment were not normal: They lacked a protein needed to keep bacteria in the intestine where they belong, and out of the bloodstream. In these mice, gut bacteria leak out of the intestines and cause inflammation as the immune system responds to the intruders. That inflammation, the scientists found, altered the body's sensitivity to insulin, a hormone that normally suppresses appetite and regulates blood sugar and fat storage. With the insulin system out of whack, the brain doesn't receive the crucial "I'm full! Put the fork down!" signal it needs to stop us chowing down. This, in turn, led to a sort of "pre-diabetes" condition in the mice — and by the time they were 20 weeks old, they weighed approximately 5 grams more than normal animals. Gewirtz's team took the bacteria from the fattened mice and transplanted them into sterile, non-mutant mice. These mice then gained weight. Again, it seemed like just having the wrong bacteria can pack on the pounds. Scientists have plenty of data that gut bacteria affect weight in mice, but their understanding of the effects in humans remains hazy. For example, not all human studies have shown that firmicutes go hand-in-hand with obesity in people, cautions Margaret Zupancic, a microbial genomicist at the University of Maryland School of Medicine in Baltimore. In part, that is because it's much more difficult to study people in a carefully controlled way. People, after all, are out and about in the world and have a variety of food and exercise regimes, unlike genetically similar mice living in identical cages eating identical mouse chow. Another fact hampering scientific study is that intestinal bacteria are difficult to grow in a laboratory setting. Thus, scientists must study the entire community from stool samples and try their best to figure out from those which bacteria serve specific functions. To get a better handle on the human situation, Zupancic and others are now working with people in a variety of settings, collecting stool samples to further analyze the human gut community and how it interacts with our genetics and lifestyles. If certain bacterial communities do cause obesity in people, replacing the bad bacteria with the good ones seems like a possible route to weight loss. The idea is not wholly unprecedented. Doctors occasionally treat debilitating diarrhea with a transplant of bacteria from healthy stool, for example. And there is certainly evidence that products called probiotics (see the sidebar) may improve health via a spoonful or swig of bacteria-laden foods. Even simply changing your diet might sway the bacterial community in a different direction, Ley says. Next steps. Gewirtz says that someday it might be possible to swap obesity-linked bacteria for skinny-jean microbes. But scientists caution that a nice bacterial cocktail is not the next big weight-loss drink. For one thing, they don't yet know what bacteria to use if they were to try and concoct such a drink. It is difficult to sort out the relationships between all the factors that lead to obesity, including diet, exercise, genetics — and now, possibly, bacterial inhabitants. And then, for a bacterial-replacement therapy to really work, doctors would first need a way to get rid of less desirable bacteria already in residence in someone's gastrointestinal tract. The right combination of antibiotics might do the job, Gewirtz says, but there are no well-defined methods for creating such a treatment. Over the course of the study, people drinking the probiotic lost an average of 1.5% of their BMI and, on average, 1.4% of their body weight. That's about 2 pounds for a 150-pound person.